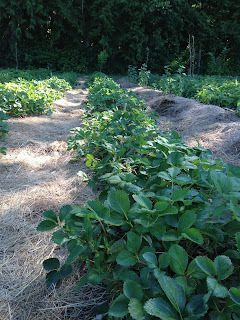 I hadn't been berry-picking in years, and I'd never been to Ash Berry Farm. Heck, I didn't even know where it was. So an almost-new experience made fresh by a new location. That should count. Particularly when you add the fact that I went by myself. Yup. 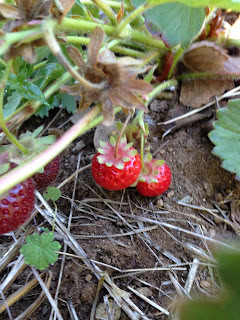 Until this week I had never considered going berry-picking by myself. I had always thought of "picking" as a group activity - something to share with your family and friends. That's how it's usually depicted. Do a Google-image search for "u pick farms" and you'll see what I mean. Lots of apple-cheeked children with berry-stained lips. Families. A few young couples. Farmers. Nary a solitary middle-aged woman in sight. As a result, going to the strawberry patch on my own felt rather adventurous. And if that wasn't adventurous enough, when I arrived, I misread the sign directing visitors to the parking lot. I went left too soon, and after a drive down a curved, rocky, bumpy track I found... chickens! Not only was there no parking lot, there was nowhere to turn around. I had to back down the curved, rocky, bumpy track. Not a problem for most people. I am not one of those people. Just the thought made me cringe, but I did it with relative ease. All part of the adventure, right? And worth it. After a quick chat with the wonderfully friendly Miguel, I hit the strawberry patch. 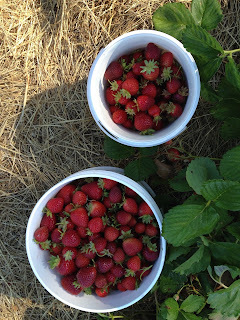 I picked 6 pounds of berries, not counting the ones I ate. What a wonderful way to spend the morning! Another successful everyday adventure. Thanks Eva. I'm having fun so far.